This distinctive building is a landmark in Ultimo, with olive-green exterior, cream trim and strong Victorian features. The family owned boutique hotel was restored just over 20 years ago, with many of the original heritage features being retained, and the interior and bedrooms updated to a more modern aesthetic. 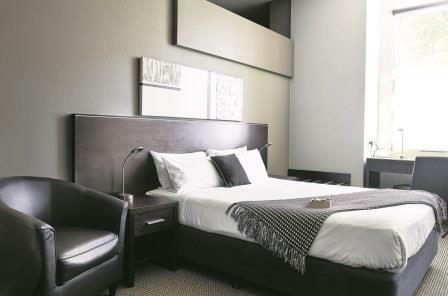 The Vulcan Hotel offers a selection of accommodation styles among its 47 bedrooms. Each of the six room types (Shoebox, Standard Queen, Standard Twin, Superior Room, Superior Twin, Studio Apartment) has an en suite and is elegantly appointed. The clean-lined, earth-tone décor is consistent throughout, giving a sense of harmony and ease. Business people and tourists make up most of the clientele, attracted to the Vulcan Hotel’s prime location on Wattle Street within easy distance of local attractions, educational institutions, shopping precincts and transport. A serene courtyard oasis, business facilities and the in-house Café Vulcan, which is a popular breakfast venue for the locals, make The Vulcan Hotel the singular choice for a unique Sydney stay.